We’d love your help. 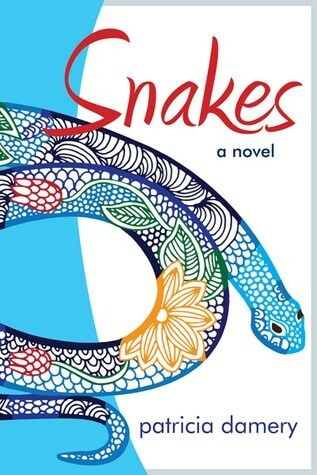 Let us know what’s wrong with this preview of Snakes by Patricia Damery. Angela Tyler has spent the greater part of her life in suspension between the world of the small Midwestern farm she grew up on, and her current life in Northern California as the wife of a college professor and mother of three. When her father dies and the family farm is sold, betrayals both small and large are brought to the surface. Angela faces these betrayals and find Angela Tyler has spent the greater part of her life in suspension between the world of the small Midwestern farm she grew up on, and her current life in Northern California as the wife of a college professor and mother of three. When her father dies and the family farm is sold, betrayals both small and large are brought to the surface. Angela faces these betrayals and finds new ground to stand on. To ask other readers questions about Snakes, please sign up. Patricia Damery is a poet beneath her cloak as a novelist. Her writing is at once disarmingly simple and rich in deep philosophical content. Damery is that sort of author who makes the reader feel regret at closing the last page and cover of her book. The very choice of SNAKES for the title of this story suggests the quality of magic that is waiting: she has taken a word that has general connotations of evil or fear or darkness and surprises her reader with that creature become a warmly familiar staff to guide us through her evolving life - not unlike a reversal of the staff of Moses becoming snakes before Pharoah! Damery leads us through her experiences with the Land in a series of remembrances of her character Angela's beloved deceased father, recalling episodes of childhood that invariably included snakes. There is much to think about in her description of the diminished greening of the earth as the small farms of her childhood congeal into soul-less amalgamations, losing the charm of the land to the greed of the 'new ones'. But the magnet of the childhood farm may summon her memory and soul, but she sets off to 'become herself' through education, marriage and children, only to return to the land in her chosen diversion of weaving wall hangings so beautiful she is wont to sell them. For Angela the weavings provide the connect to the smoldering but still glimmering past, the living source of the meaning of the cycle of life, a cycle that, yes, contains her experiences with snakes and stories of snakes. SNAKES is, then, a beautifully crafted memoir of each of our lives, as each of us can find a warp or weft or heddle that manages to help us weave our lives into a meaningful and loving existence. It is her strong bond with nature that endears her writing and makes this book an extended and lovely poem. Snakes, by Patricia Damery (Farming Soul, 2010) is a beautifully written novel about a woman coming to terms with family continuity as small farms are packed up and sold off at auctions to those who will never know who once lived there and made of them enduring homes. Angela leaves the Midwestern farm her family has worked for generations because the roads and fields and traditions are, in spite of their deep values, confining to her coming-of-a-age soul. She attends college in California, receiv Snakes, by Patricia Damery (Farming Soul, 2010) is a beautifully written novel about a woman coming to terms with family continuity as small farms are packed up and sold off at auctions to those who will never know who once lived there and made of them enduring homes. Angela leaves the Midwestern farm her family has worked for generations because the roads and fields and traditions are, in spite of their deep values, confining to her coming-of-a-age soul. She attends college in California, receives a degree in biology, becomes a teacher, marries, and has a family. When teaching proves to be an unsatisfactory career, she focuses on her new and all-consuming avocation of weaving. Snakes is a poetic meditation about the intertwined cycles of life and farming. It is also an evolving letter of love from Angela to her recently deceased father about life as it was, mundane and unexpected daily events, and, of course, the snakes. Snakes and the cycles of life are constant images throughout the book; snakes in the corn crib, snakes in the garden, snakes in the kitchen. We fear snakes, yet we also see them as protectors of the land and as symbols of the natural stages of everlasting life. For Angela to come to terms with herself and the disintegration of families and farms, she must come to terms with snakes. Her weavings become her medium and her message, the storyboard of her life as it was and as it is, all the memories, dreams and reflections of a nurturing mother claiming her authentic role within the natural order of children and husbands, kitchens and bedrooms, warm tidal pools and freshly ploughed fields, and gardens where snakes live amongst the flowers. Dolorem cumque et sit hic enim sunt commodi. Ea commodi quibusdam dolorem et quasi est. Unde amet dolore corrupti earum voluptatum sunt praesentium. Voluptatem vero ipsam vitae.